There are currently 29,484 users on this website. 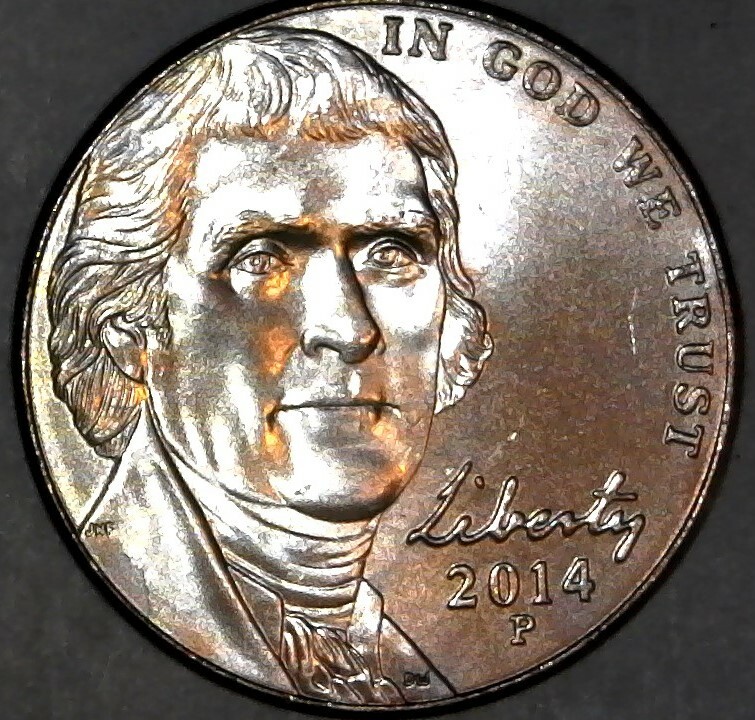 In late February of this year, Scheschuk noticed an unusually shiny 2014-P Jefferson 5-cent coin in a cash drawer at work. He later found two more that day and a few others the next day. After finding several more in a newly opened roll of 5-cent coins, he concluded that they were all coming from a batch of 2014-P 5-cent rolls that had been stockpiled by his boss. Scheschuk persuaded his boss to part with the remaining rolls in exchange for an equal number of rolls that Scheschuk obtained from his own bank. A search through the rolls left Scheschuk with a small pile of these distinctive errors. Uncertain of what kind of error he had, Scheschuk placed several of the coins up for auction on eBay. When I saw the accompanying images, I immediately recognized what they were and purchased two. As expected, all of the defective 5-cent coins were struck by the same die pair. The reverse face shows design creep while the obverse face is normal. As with nearly all recent circulation strikes (2002 to present), the reverse die functioned as the hammer die. The reverse face lacks the design rim, because this portion of the die face extended beyond the working face of the collar. All of the peripheral letters on the reverse face are cut off where they meet the coin's edge. Truncation is more severe along the southern arc of the coin's perimeter, possibly due to a slight asymmetry in the degree of radial expansion. This is not unexpected, as many soft die errors show asymmetrical and localized development. In fact it's conceivable that a future case of design creep might involve only a portion of the die's circumference. Since the flared hammer die face was wider than the collar, one might anticipate the die pressing down upon the collar, generating a thin partial collar flange along the upper portion of the edge. However, no partial collar is seen on any of the 2014-P 5-cent coins. This is not particularly surprising, given that horizontal misalignments of the hammer die don't consistently generate a partial collar. In a horizontal misalignment, part of the hammer die overlaps the top of the collar, potentially depressing it (many collars rest on springs or air pistons). Another possible reason why the collar wasn't depressed during the production of the design creep errors is that the hidden portion of the die's perimeter may have sloped down, away from the collar — another resemblance to the blunt end of a rock chisel. The reverse face is highly reflective and has a peculiar cottage cheese texture that is best developed in the center of the coin. Here the details of Monticello are indistinct. The odd surface texture is simply another indication that the die was experiencing abnormal plastic deformation. Scheschuk reports that all his coins show approximately the same amount of letter truncation. Any slight differences in the cut-off points can easily be explained by slight variations in striking pressure or planchet upset. It therefore seems that there was no further expansion of the die face during the time period encompassed by his sample. This is unsurprising, because many soft die errors develop quickly and then stabilize, perhaps because of progressive work-hardening during the press run. The total number of coins produced by this die pair is unknown. They could turn out to be common or they might be quite scarce. It all depends on when the reverse die was pulled from service. Thank you Jim and GrapeCollects! It was kinda expensive, but it was well worth what I paid for it! 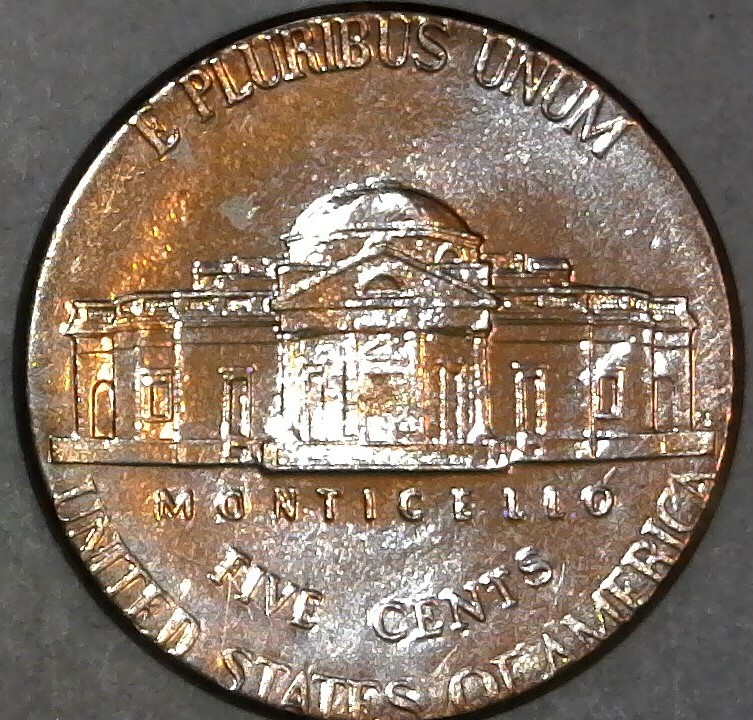 It's a rare error coin with only one single die run being affected. Very nice, interesting piece. Congrats! Thank you Chase007, Tunnioc, and CoinHunter27! It was nice to make an expensive purchase on good error coins. It's something that I rarely do and I don't do it very often.